Remodeling jobs often take place in either the kitchen or the bathroom, where plumbing fixtures become the focus of a great deal of attention. We use our sinks, showers and toilets more often than any other appliance in our homes, and as such, we want them to look their best while providing ideal practical service. When one or more elements are off, it can drive you up the wall. The good news is that there’s a service in Bergenfield, NJ that can help you with such modifications, either on their own or as part of a larger remodeling project. Why modify existing fixtures? Here’s a few thoughts. Posted in Remodeling | Comments Off on WHY MODIFY EXISTING FIXTURES? WHAT SHOULD I KEEP IN MIND WHEN REMODELING MY KITCHEN? A kitchen remodeling project can be an amazing experience, transforming one of the most important spaces in the house into the kitchen you always wanted it to be. Here in Bergen County, NJ, there are plumbing services available to consult and plan your remodeling project with you before installing new pipes and fixtures to match your plans. The more preparation you can do with them, the fewer problems you will encounter and better off your final remodeling will be. Here are some things to keep in mind when remodeling your kitchen. Posted in Remodeling | Comments Off on WHAT SHOULD I KEEP IN MIND WHEN REMODELING MY KITCHEN? Remodeling a kitchen or bathroom is an exciting endeavor, but the remodel doesn’t happen without a lot of work, and part of this work may involve upgrading your plumbing along with the remodel. But when you hire a professional from BZ Dependable Plumbing & Heating, Inc., for remodeling, you won’t have to worry if your plumbing in Passaic County, NJ also needs remodeling. This is because our remodeling experts bring years of design, planning and experience to each job, and you can count on our professional plumbers to install your newly-remodeled plumbing quickly, efficiently and correctly. Plumbing pipes can be 40-50 years old, and when they reach this age, they are prone to corrosion and other problems that can affect how they work. Additionally, if any of the pipes are lead, they have to be replaced by law. Once rust takes hold of something, it is very hard to stop it. If it’s found that the plumbing in the area you are remodeling is seriously corroded, it will need to be replaced. Sometimes certain sections can be replaced, but if the corrosion is widespread, it will be necessary to replace all the plumbing that has rusted. Many remodels make better use of space, and sometimes this means moving the plumbing around to accommodate the new design of the room. As such, it may be necessary to upgrade plumbing so that the move can happen as needed and so that your existing plumbing matches any new plumbing that is installed. Your new remodel isn’t just about improving looks and comfort, it is also about improving function – and having an efficient, well-planned and correctly installed plumbing system is a big part of that functionality. 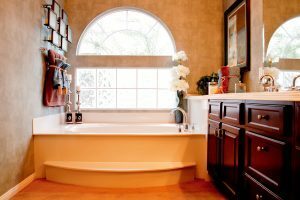 If you are ready for a new kitchen or bath remodel, and think your plumbing in Passaic County, NJ may need remodeling, too, call the people you can trust: BZ Dependable Plumbing & Heating, Inc.
You may not realize that the fixtures in your bathroom and kitchen are costing you money in water waste. Older fixtures use much more water than newer fixtures. Thanks to developments in green technology, there are excellent high-efficiency installations for your plumbing that will increase your water savings to a level you never thought possible before. One of the best times for installing energy-efficient plumbing is during a remodeling project. Whether it’s for a bathroom or a kitchen, plumbing remodeling in Dumont, NJ will benefit from adding fixtures that reduce water waste. Here are some of the options available to you when you schedule plumbing remodeling for your home that will help you save energy. Call the remodeling professionals at BZ Dependable Plumbing & Heating, Inc. to find out more details about your choices. ENERGY STAR-certified dishwashers make a tremendous improvement in how much water and power the use to clean your kitchenware. If you have a dishwasher from pre-1994, you are probably paying an extra $40 each year on your bills than you would if you had an ENERGY STAR model. Just like that, you have paid for detergent for the whole year! Certified dishwashers will also save around 1,300 gallons of water during their service lives. Whether placed in your bathroom or your kitchen, a low-flow faucet can reduce water usage by 30%. A WaterSense® faucet (manufactured in partnership with the EPA) can reduce the standard faucet’s flow of 2.2 gallons per minute to 1.5 gallons per minute—and without a loss in performance. The average family can save 700 gallons of water per year, which is equivalent to 40 showers, with the help of WaterSense® faucets installed in a home. Toilets use more water than any appliance in your house: sometimes a third of your annual indoor water use. Depending on the age of your current toilets, you can reduce the water use by 20–60%, which is equal to almost 13,000 gallons of water and savings of $110 each year and $2,200 over the appliance’s lifetime. All of these appliances require the work of professional plumbers to select and install. When you make them part of your plumbing remodeling in Dumont, NJ, you can have the plumbers handle putting in the new fixtures and appliances so they do the efficient job they are supposed to. You can trust to the experienced plumbing remodelers at BZ Dependable Plumbing & Heating, Inc. to help you get the most energy- and water-efficient new bathroom or kitchen possible. Remodeling is a fantastic opportunity to make major changes to your Bergenfield home and its layout and decide exactly how you want your bathrooms or kitchen to look. But before you get started, here are a few tips to follow that will ensure the job gets done exactly as you want. When making changes to your home, comfort should be at the top of your list, but so too should the value of your home. That’s why kitchens and bathrooms are often at the top of the list in terms of remodeling. Other things to consider include new siding, windows and decks, but in terms of what you can do in your bathrooms and kitchen, aim for things that bring real value to your home. This includes new low flow fixtures, upgraded water lines and drain pipes, and new counters and flooring. Before you call the first contractor on your list, create a thorough list of things you’d like changed. This list will allow you to contact someone who has a clear idea of what you need and will help you avoid the waffling that often occurs when a contractor comes to do an estimate. It also helps you know what your budget actually is and what changes to your plans may be needed. Above all else, make sure you plan for the remodel. Don’t assume the remodeling process will be done in a single day – be ready for many days of inconvenience in your home. Know where you can take your children for the day and how you’ll make meals when your kitchen is in pieces. Remodeling can be a stressful experience if you don’t plan it out well in advance. But with the right forethought it can ensure you have the exact bathrooms and kitchen you always wanted. For more information about bathroom and kitchen remodeling in Bergenfield, give BZ Dependable Plumbing & Heating Inc. a call! Remodeling your Teaneck home is a great investment and can be a satisfying accomplishment once it’s done. Any remodeling project is a major one, however, and therefore requires some strategizing and careful execution in order to prevent setbacks, added expense, and a great deal of frustration. Here are some tips to help your remodeling project go smoothly, and help you keep your sanity. Hire a professional, licensed Teaneck contractor to perform the work. Make sure the contractor you hire is well-versed on the most recent building codes in the area. Use a detailed design process to develop a plan for the room(s), choose materials and fixtures, and create a realistic budget for the project. Consider staging the work ahead of time to give yourself a realistic idea of the work to be done and cut down on labor costs. Rather than repairing minor blemishes on walls by doing costly structural work, considering using materials to mask the wall, as long as it is still structurally sound. With minor imperfections, discolorations or slight damage, you can use a decorative painting technique or a heavier, textured wallpaper to cover up the area. Likewise, if a room just needs to be livened up, consider repainting first before getting more involved. You may find that the new color is enough to spruce the area up. Rather than creating new space by knocking down walls or building new additions, try instead to create the illusion of more space. Mirrors, skylights, and additional windows are all simple ways to make a small room seem bigger without the trouble of adding square footage. By keeping some of these tips in mind, you can help to ensure that your house becomes the dream home you have always wanted, without the nightmares of costly or incorrect updates. If you have any questions about plumbing modeling, please give BZ Dependable Plumbing & Heating a call today!